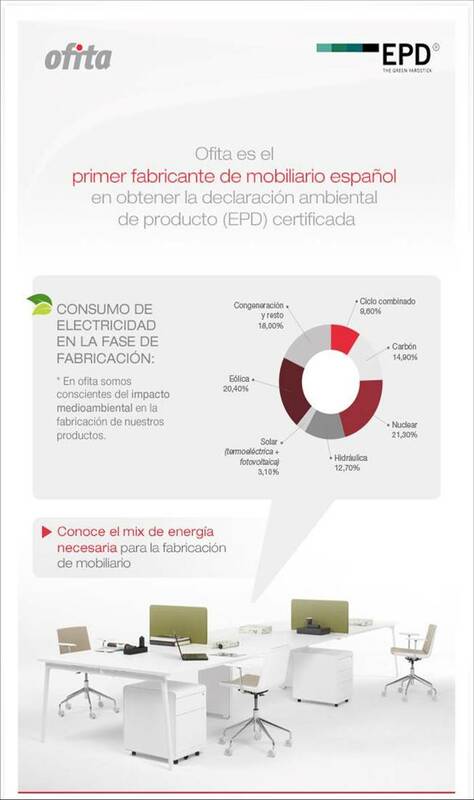 Ofita, as part of its policy of innovation and commitment to the environment, has become the first Spanish office furniture manufacturer to achieve the Environmental Product Declaration (EPD) certification, after successfully passing the audit. There are eight products with EPD certification, among which are the FRESH, OX and GEN office desks. The EPDs of the Ofita products have been certified according to the criteria of ENVIRONDEC, and are published on its web site www.environdec.com/es/, available for consultation on a worldwide basis. An Environmental Product Declaration is an internationally recognised environmental certification, awarded in accordance with the ISO 14025 and ISO 14040-44 standards concerning Life Cycle Analysis. EPDs are intended to provide relevant, verified and comparable information on the environmental impact of goods and services. With these certified EPDs Ofita once again demonstrates its commitment to sustainability. The declaration joins other certifications that corroborate this commitment, such as the ISO 14001, ISO 14006, PEFC, FSC, as well as Ofita’s support for the United Nations Global Compact network.